In todays society Active Shooter and Mass Casualty events are being experienced at much greater frequency than before. The fact is that Emergency Services at its quickest reponse, is generally 6-11 minutes in most urban areas, you can bleed to death in under three (3). The first initial response to any such incidents is going to be other civilians and the general public. OSS has invented numerous Advanced Bleeding Control kits designed for use by the general public. These kits are currently being used in Airports, Malls, Public Transportation Centers and Schools throughout the nation. They are designed to aid in stopping the blood loss from the most severe injuries experienced at these mass casualty events. At OSS we have used our decades of professional experience to put together a "civilian model" of our Combat Casualty Care course that we have been teaching for several years to our nations first responders and emergency services operations. We offer this to the general public to help teach the most innovative tactics on first aid and help educate the general public on what to do on scene, how to be prepared and how to recognize the threats before they occurr. This is one of our most popular Advanced Bleeding Control Packs to date, it includes six (6) individual Advanced Bleeding Control kits that are velcroed to an insert pack thus easily removable and readily available. These compact packs contain tourniquets, compression gauze, sterile rolled gauze, cloth medic tape and compression bandages. All of which are included in the Field Application card also contained in each kit. these kits can be thrown, kicked or slid to injured people on any surface and has bi-lateral zippers to make it easy to open with little effort. 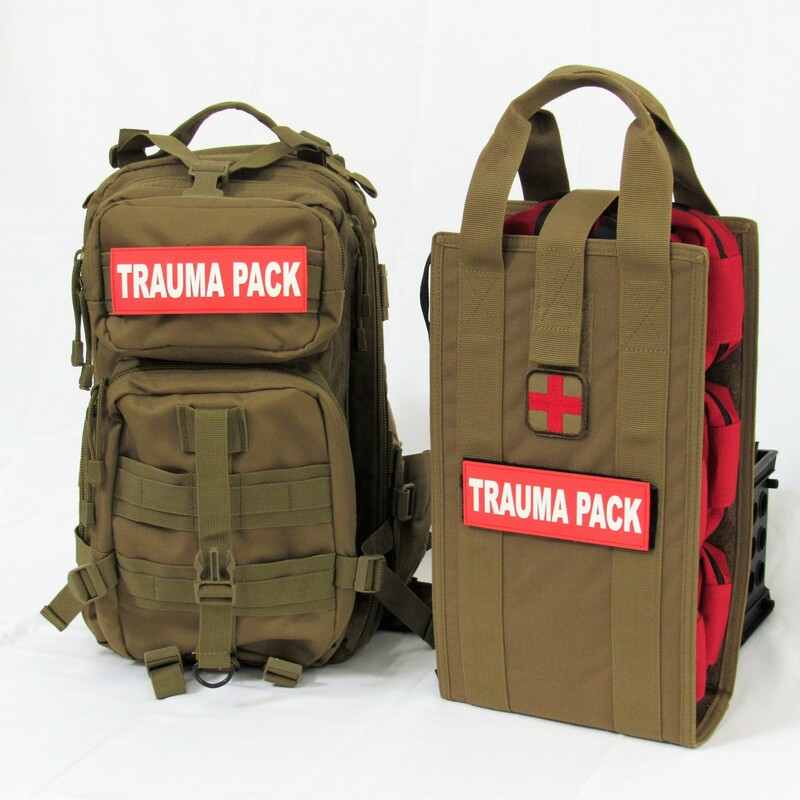 The insert is contained in our subdued colored medic backpack with identifiable PVC Patches affixed to the front and rear for rapid identification and deployment. The main backpack/bag contains its own critical medical supplies to treat several victims at the site and still contain the Insert to handout to individuals to aid others. This and all our kits are built to the guidelines and in support of the national Stop The Bleed campaign being advertised by our federal government.